A sampling of design projects I have completed. Framing for a potential retreat space I designed for the Queen of Peace Monastery. A woodstove I designed for a class at Quest. I have still not gotten a chance to fabricate it and test the idea! 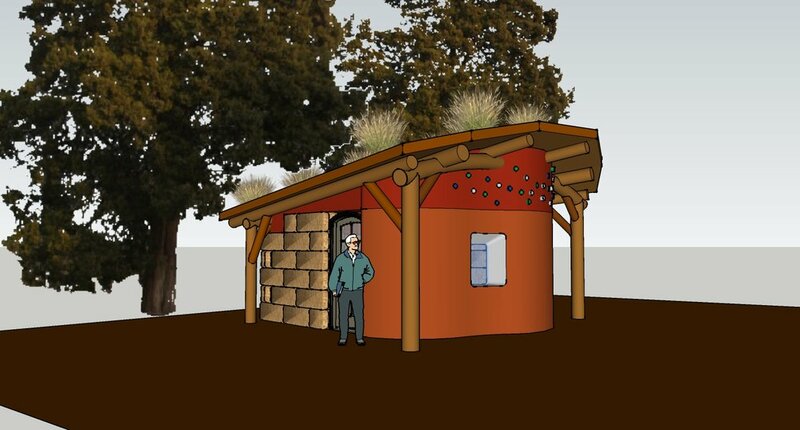 Design for a guest accommodation cabin at OUR Ecovillage, which I drew as part of a naural building course I took there in 2015. 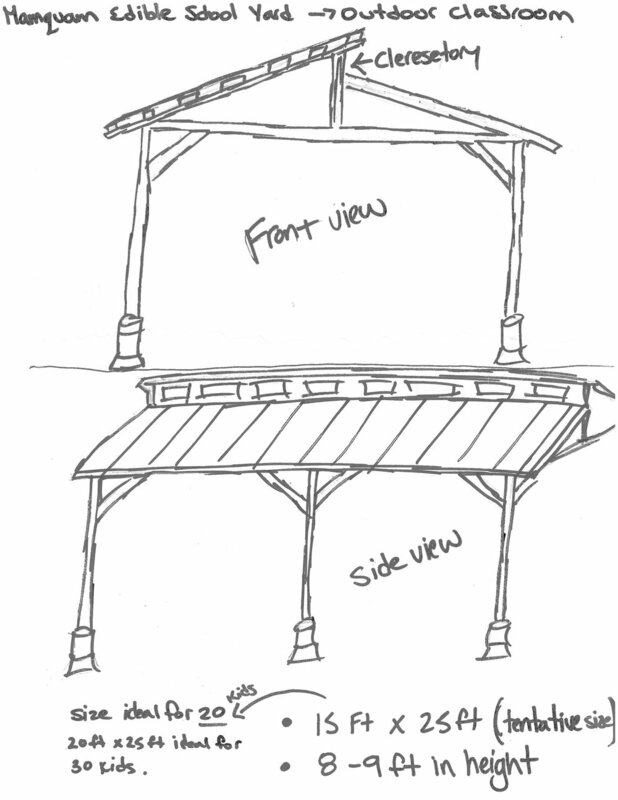 A quick sketch a client emailed me of a deck they were thinking about building, which I 3D modeled for them (see next image). A deck idea I 3D modeled. The client is able to clearly see and change design details not evident in a quick 2D sketch. Once approved by the homeowner I sent drawings and a materials list to the contractor for an estimate. A room inside the Whistler Athlete's Center that had a terrible reverberation, making it hard to understand people's words, and difficult to focus. 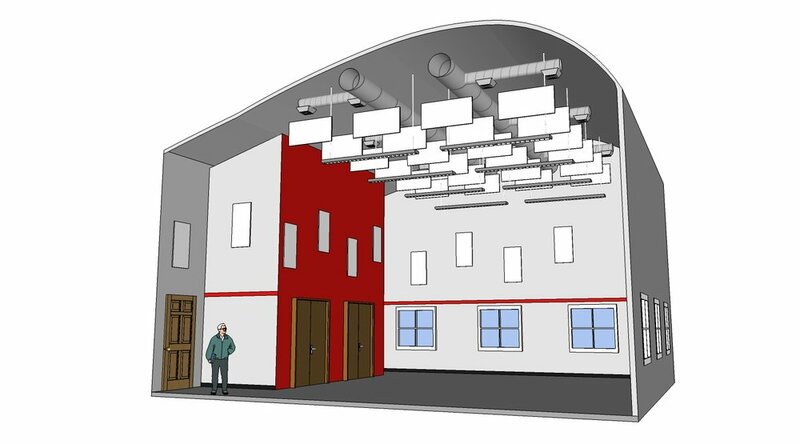 After conducting reverberation tests I modeled the room and ran some analysis, calculated the number of acoustic absorption panels necessary to improve the sound quality, and suggested locations and mounting details to their maintenance team. Not every project requires a detailed 3D model! I love meeting with clients early in their process, and helping them define location, use, needs, and various design constraints. Even a simple structure can benefit from thorough design considerations! This series of drawings show the proposed changes to an existing attached garage. The client wanted a floor added to create a second story to be used as a media room with attached storage areas. Being and unfurnished, I also designed storage and work areas for the garage. Once the client approved the above drawings, I modified them into permit drawings, shown here. These were submitted for permit alongside the engineering and site setback documents. Once approved, the next step is to create construction documents for the contractor. This series is images is an excerpt from the construction drawings I did for a two car garage with a studio apartment on top.